The Zeppelin raids of 1915 brought physical destruction and great terror to London. The horror was so much that the suicide of London landlord John Nicholas Petry in 1932 was blamed of his experience in a raid 17 years earlier. The fifth air raid on London killed 47 people and injured more than 100. 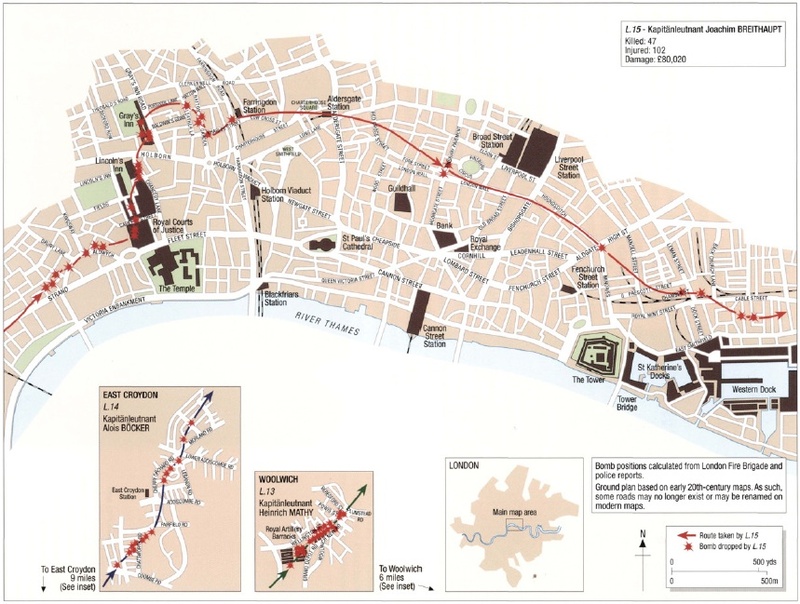 On the night of 13/14 October 1915, Zeppelins L13 and L14 bombed Woolwich and East Croydon respectively, while L15 dropped bombs on Westminster and across the City of London. 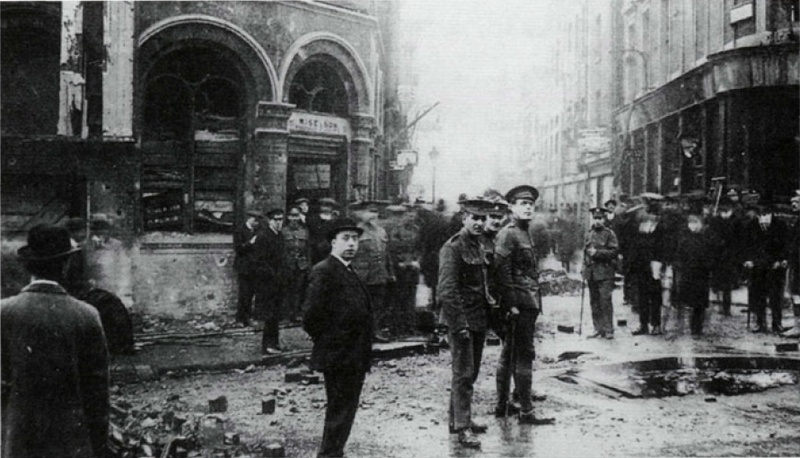 The first of L15’s bombs fell on and around the Lyceum Theatre just off the Strand. The first bombs fell during the interval of the performance at the Lyceum, striking the theatre and the roads around it. The Old Bell pub, just behind the theatre, was full of customers (including theatre-goers). 17 people were killed by the bomb on the junction of Exeter St and Wellington St, including eight in the pub, and 21 others were seriously injured. The Zeppelin continued its destructive visit to the capital, dropping further bombs around Lincoln’s Inn, Grey’s Inn, Farringdon and Aldgate. (L15 returned home safely that night, but it was destroyed a few months later by anti-aircraft fire while on another bombing mission). The death and destruction in and around the Old Bell must have been shocking to all who witnessed it, but it was particularly disturbing to the landlord, John Nicholas Petry. Petry was born in Battersea in 1880 and married Minnie Louisa Hopkin in 1906. By 1911, they were running the Swan pub in Leadenhall Market and lived there with their two year old son John Bernard Petry. By 1915, they had taken on the running of the Old Bell, where they witnessed the deaths of customers and passers-by on the night that Zeppelin L15 first visited London in October that year. 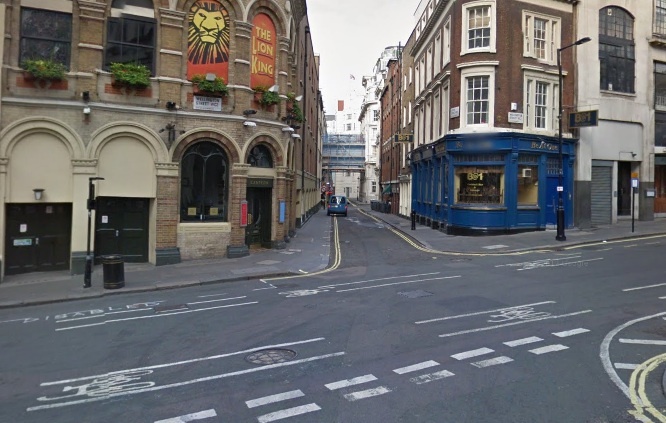 The same junction today (Google streetview image) – the Old Bell has been replaced by a blue-fronted cafe. John Nicholas Petry, as a married man, became liable to be conscripted into the armed forces in June 1916 – when compulsory service was extended to married men. He wasn’t called up right away, but did end up joining in February 1917. His wife later claimed that this was after seven attempts to join up, which seems odd given that he was relatively fit (although he did have flat feet) and not in an essential war industry. Either way, he ended up in the Army Service Corps in 1917, where they made the most of his experience as a ‘licenced victualler manager’ by sending him out to work in the British Expeditionary Force’s canteens, initially in the 5th Army area and later (from November 1917) in the 3rd Army area. Minnie Petry also claimed that he suffered from shell shock while in France, which may have been behind his period in hospital in July 1918, but it is not clear from his service record (his condition is recorded as ‘PUO’ – Pyrexia of Unknown Origin). When peace came, Private Petry was demobilised and returned to the pub at 23 Wellington Street. He reportedly had regular medical attention through the rest of his life. In January 1932, he poisoned himself with disinfectant and died in the Homeopathic Hospital on Great Ormond Street. The coroner, P.B. Skeels, reported that Petry had ‘no doubt’ suffered from neurasthenia since the air raid and had not been the same since – neurasthenia was the generic medical term for post-traumatic stress (often a synonym for shell shock). The verdict on Petry’s death was ‘suicide while of unsound mind’ – showing the mental strain that the terror of air raids could (and can) cause. His death came too late for him to be officially recorded as one of Britain’s war dead, but his death was clearly a result of his wartime experiences – and particularly his experience of the night of 13/14 October 1915 in London. On Petry’s life : army service record, census, and Daily Mirror and Times reports of his death. There must be many such sad stories illustrating how war goes on affecting individuals and communities long after the peace has been signed. Often, though, people like Petry fade into the background and their sufferings go unrecorded. Today, though we use the grandiose label “post traumatic stress disorder”, those suffering from it as a result of military service often still have a long and hard fight ahead of them to achieve recognition and help. Interesting story. I’ve just finished William Boyd’s Waiting for Sunrise so this story about the raid that night was rather poignant.